On Thursday we saw a familiar sight, a Steven Gerrard assist for a Luis Suarez goal. For once, at least for Liverpool fans it was not a sight we wanted to see as Uruguay effectively knocked England out of the 2014 World Cup. After the match the England captain came in for some unnecessary criticism in which many media outlets and twitter accounts harshly blamed him for the defeat. Despite the 2013/14 season being his personal best for 5 years, it will most likely be remembered for that slip against Chelsea at Anfield. For me, Steven Gerrard is the best midfielder the Premier League has ever seen, and a player which England fans should not forget as replacing him will be a long and difficult task. This is my third piece on football's 'one club men', a phenomenon which is becoming a rarity in the modern game, now seen as one ruled by money and businessmen. The recent 'Players Who Shook the Kop' poll saw Gerrard ranked as the best ever Liverpool player, an honour which considering the wealth of talent the Merseyside club has seen throughout history, is surely one of his greatest personally. In this piece I am going to look at 'Stevie G's' career, from his earliest days at Anfield to his captaining of England to two World Cups. Should he be regarded as one of England's finest? Let's have a look! Following two years in and around the first team at Anfield, Gerrard's breakthrough came in the illustruous 2000/2001 season. Under the stewardship of Gerard Houllier, Liverpool went on to win a treble (FA Cup, UEFA Cup and League Cup) as well as the Charity Shield and Super Cup. Gerrard played a key role in the triumph appearing in 50 games throughout the campaign. In the 5-4 UEFA Cup victory over Alaves in Dortmund he managed to score his first goal in a major final cementing his place in Anfield folklore and future Liverpool sides. By the end of the season Gerrard was awarded the 'PFA Young Player of the Season Award'. Liverpool's 1990s production line had come good as McManaman, Fowler, Owen and Carragher had all managed to make certain their place in the thinking of successive Liverpool managers. “Sometimes you have a player like Gerrard. 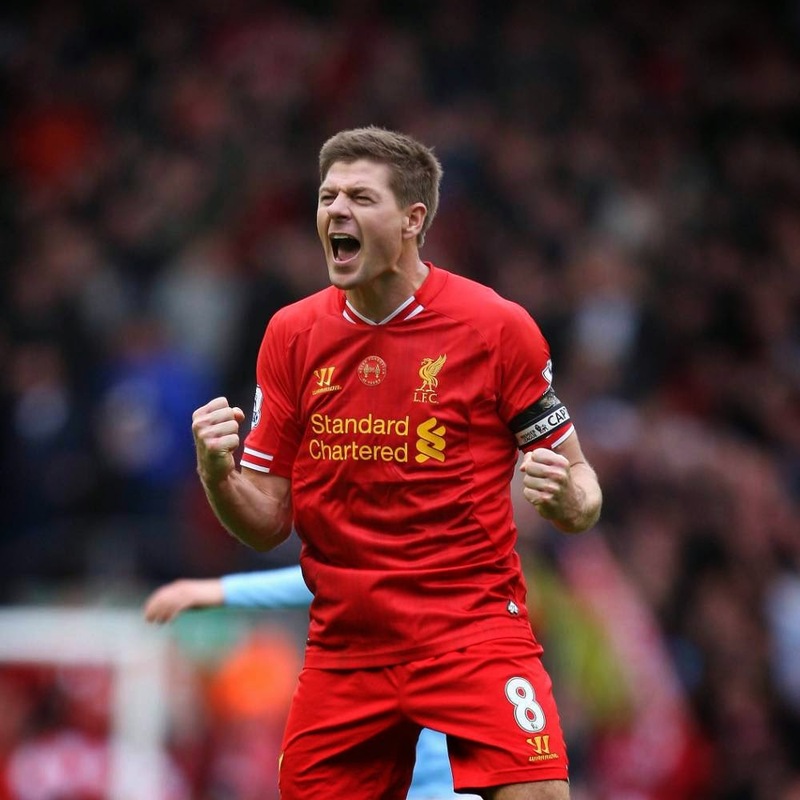 For me, for the last five years Gerrard has been the best player in the world." To think that since Gerrard no young scouse Melwood talent has really become a first regular (except Jon Flanagan) is staggering. Whether this is due to a lack of potential in modern British football or due to the higher standard which Gerrard and co produced is open to debate. After being made captain in 2003, aged just 23 the following season would be one of trophy-less disappointment, ultimately leading to Houiller's sacking and the appointment of Spaniard Rafa Benitez. Gerrard had achieved a great deal under the former, but it was Benitez's reign which really saw him become one of the World's finest footballers. A picture no Liverpool fan will ever get tired of. Of course, with Steven Gerrard it would be almost impossible not to think of Istanbul when his name is mentioned. It is the match which he shall be remembered for when he retires. After being 3-0 down at half-time to an AC Milan side, which at least on paper has to be one the greatest ever assembled (all 10 outfield players made the #TFHBtop250), Gerrard managed to captain the side to a stirring comeback. After scoring 54 minutes in to give Liverpool hope, the skipper produced a sublime individual performance to see the side back into the game and through extra-time (Gerrard was actually playing right-back for the final 30 minutes.) Jerzy Dudek's penalty shoot-out heroics ensured the greatest sporting comeback was achieved and a 24-year-old Steven Gerrard lifted the trophy amid jubilation in Turkey. "Is he the best in the world? He might not get the attention of Lionel Messi and Ronaldo but yes, I think he just might be, if you don't have a player like Steven Gerrard, who is the engine room, it can affect the whole team." There have been so many pivotal moments in Gerrard's career that it makes it difficult to refine them into one single blog post. For many Liverpool fans, myself included the 2006 FA Cup Final victory over West Ham in Cardiff epitomised the player. 3-2 down and suffering with cramp, Gerrard managed to fire a 35-yard thunderbolt past Shaka Hislop and into the net to once more produce extra-time and a penalty shoot-out victory. It was this 'get out of jail free card' which the Liverpool captain managed to make his trademark, notably scoring late goals vs. Middlesbrough (2008), Arsenal (2008) and recently Fulham (2014). The following season Liverpool reached yet another Champions League final in which Milan got their revenge with a 2-1 win in Athens. After narrowly missing out on the Premier League title in 2009 to Manchester United, Gerrard's career took a downward turn, not due to personal performance, but injuries and managerial changes. Following the short tenure of current England boss Roy Hodgson at the Anfield helm, the return of the 'King' Kenny Dalglish continued Liverpool's run of mixed performances. 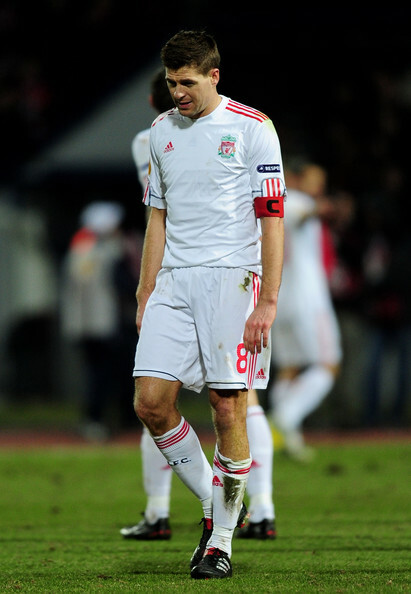 Despite finishing the season strongly, a host of poor signings and an injury-hit Gerrard meant he did not feature for almost the entirety of 2011. He described his feelings during his lengthy lay off, "There were times when I was as low as I've ever been as a footballer." It was testament to his character that since his lowest ebb he has recently played his best football for half a decade. Of course Dalglish helped in this, not rushing his star player back to fitness, but it is Brendan Rodgers who Gerrard surely owes his recent success too. Rodgers, who has bred a competitive Liverpool side, deserves credit for his redesign of tactics on Merseyside and his reinvention of Gerrard's personal game in the defensive midfield mould. Despite playing further back earlier in his career, the new role has placed greater emphasis on his the captain's' passing ability and dominance in midfield next to Jordan Henderson and Lucas Leiva. Gerrard himself admitted earlier this season that 'I haven't felt better.' It is this fitness and redesign that led to the maestro scoring 14 goals and a league best 13 assists, resulting in a place in the PFA team of the season and a nomination for the player of the season award (won by teammate Luis Suarez). For England, we have seen a different picture to that of the jubilation and victory at Liverpool. Since making his debut in 2000 against Ukraine, Gerrard earned a call up to the national squad for Euro 2000. Despite playing in the 1-0 victory over Germany, home-sickness meant the young star couldn't rekindle his club form and an early exit ensued. More disappointment would follow, a groin injury which has become a continual headache meant he would miss the 2002 World Cup in Korea/Japan. It was the qualification for the 2002 tournament which made sure of his place in the starting XI, scoring memorably against Germany in Munich, 5-1 anyone? Euro 2004 however gave Gerrard a chance to perform on the continental stage, scoring against Switzerland and reaching the quarter-finals were a penalty shootout defeat to hosts Portugal saw an early exit. Only Shilton and Beckham have played for England more. Further shootout heartache, once again at the hands of Portugal saw another quarter-final defeat for England in the 2006 World Cup. For Gerrard personally it was a decent tournament, scoring twice against Trinidad and Sweden. After the embarrassment of losing to Croatia in 2007 and missing out on Euro 2008, further frustration followed at the South Africa World Cup. Once more however, Gerrard was arguably England's best player, scoring against USA and any disappointment more at the hands of Fabio Capello's negative tactics and defensive frailties. Personal respect was restored at Euro 2012, where a for once unfancied England side reached the quarter-finals, with Gerrard himself making the team of the tournament for his 3 assists. "It is never normal for me to play against Gerrard, It always gets me emotional, I won’t deny it. Of course, on the field you’ve got to get stuck in there, but it is always a pleasure and an honour. He’s also a very nice guy, always very approachable." Much will be written about Steven Gerrard and his performance at this 2014 World Cup, which for me has been maybe a little below par. If anything, this has been due to his usually outstanding levels of performance and attitude. He has not played bad, just not set the world alight. After the tournament there is no doubt he will be under pressure to give up the armband and even retire from international football alongside the last of the 'golden generation' Frank Lampard. Whether this happens is another question all together, but from looking deeper into the story of Merseyside's finest it becomes evident that when he does hang up his boots it will not be his near-misses with England for which he shall be remembered but his unbeatable Liverpool career which shall be discussed for years to come. Steven Gerrard still has years at the top of the game and has finally qualified for the Champions League again, the perfect stage to cement his legacy as one of British football's greatest ever. More of the same next season?